Amazing white sand beach and ocean front access! Shopping and dining options are conveniently located across the street at the Poipu Shopping Village or nearby in historic Koloa Town. You will also find a world class golf course, five star tennis facility and a full-service "front desk" just a few steps away! 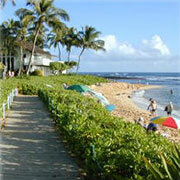 There is a beach activity hut located on the edge of Kiahuna Beach. They supply complimentary towels, beach chairs and childrens beach toys. They also sell sells drinks, sandwiches, salads, and snacks, sunglasses, and sun-lotions. Snorkel equipment and Boogie Board rental is also available at beach activities hut. Try your luck at surfing right out front of the Great Lawn. The Poipu Shopping Village offers an open-air shopping experience with a fun selection of shops, services, and eating establishments. The medley of gift choices here is incredible. Pillows, Hawaiian handmade paper, unique jewelry, children's items, formal and fun apparel (including silk dresses), swimwear, candles, soaps, sterling silver items, and enough to keep you browsing for a day or more. 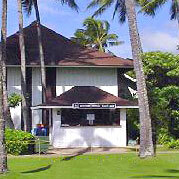 The numerous surf shops offers surfwear, swimwear, and watersports equipment. Nearby Old Koloa Town is another stop worth making, with its funky island apparel, Kauai-artist-only crafts, coveted Niihau shell leis, a variety of dining and snacking establishments, local grocery store, candles, soaps, and more. Your much desired ground level front entry to Unit #233 at the Kiahuna Plantation, your all inclusive vacation condo rental. Step in entrance. 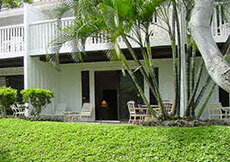 Beautiful tropical scene just outside your lanai enables you to enjoy outside dining at it's best. Additional lounge chairs and table beckon you to sit, relax and enjoy your time here.